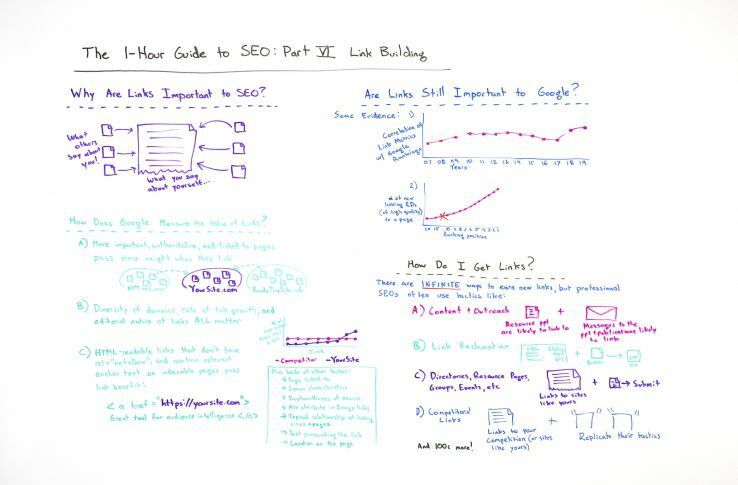 The final episode in our six-part One-Hour Guide to SEO series deals with a topic that's a perennial favorite among SEOs: link building. Today, learn why links are important to both SEO and to Google, how Google likely measures the value of links, and a few key ways to begin earning your own. So we've discussed sort of how search engines rank pages based on the value they provide to users. We've talked about how they consider keyword use and relevant topics and content on the page. But search engines also have this tool of being able to look at all of the links across the web and how they link to other pages, how they point between pages. So it turns out that Google had this insight early on that what other people say about you is more important, at least to them, than what you say about yourself. So you may say, "I am the best resource on the web for learning about web marketing." But it turns out Google is not going to believe you unless many other sources, that they also trust, say the same thing. Google's big innovation, back in 1997 and 1998, when Sergey Brin and Larry Page came out with their search engine, Google, was PageRank, this idea that by looking at all the links that point to all the pages on the internet and then sort of doing this recursive process of seeing which are the most important and most linked to pages, they could give each page on the web a weight, an amount of PageRank. Then those pages that had a lot of PageRank, because many people linked to them or many powerful people linked to them, would then pass more weight on when they linked. That understanding of the web is still in place today. It's still a way that Google thinks about links. They've almost certainly moved on from the very simplistic PageRank formula that came out in the late '90s, but that thinking underlies everything they're doing. Today, Google measures the value of links in many very sophisticated ways, which I'm not going to try and get into, and they're not public about most of these anyway. But there is a lot of intelligence that we have about how they think about links, including things like more important, more authoritative, more well-linked-to pages are going to pass more weight when they link. That's true of both individual URLs, an individual page, and websites, a whole website. So for example, if a page on The New York Times links to yoursite.com, that is almost certainly going to be vastly more powerful and influential in moving your rankings or moving your ability to rank in the future than if randstinysite.info — which I haven't yet registered, but I'll get on that — links to yoursite.com. This weighting, this understanding of there are powerful and important and authoritative websites, and then there are less powerful and important and authoritative websites, and it tends to be the case that more powerful ones tend to provide more ranking value is why so many SEOs and marketers use metrics like Moz's domain authority or some of the metrics from Moz's competitors out in the software space to try and intuit how powerful, how influential will this link be if this domain points to me. So the different kinds of domains and the rate of link growth and the editorial nature of those links all matter. So, for example, if I get many new links from many new websites that have never linked to me before and they are editorially given, meaning I haven't spammed to place them, I haven't paid to place them, they were granted to me because of interesting things that I did or because those sites wanted to editorially endorse my work or my resources, and I do that over time in greater quantities and at a greater rate of acceleration than my competitors, I am likely to outrank them for the words and phrases related to those topics, assuming that all the other smart SEO things that we've talked about in this One-Hour Guide have also been done. HTML readable links, meaning as a simple text browser browses the web or a simple bot, like Googlebot, which can be much more complex as we talked about in the technical SEO thing, but not necessarily all the time, those HTML readable links that don't have the rel="nofollow" parameter, which is something that you can append to links to say I don't editorially endorse this, and many, many websites do. If you post a link to Twitter or to Facebook or to LinkedIn or to YouTube, they're going to carry this rel="nofollow,"saying I, YouTube, don't editorially endorse this website that this random user has uploaded a video about. Okay. Well, it's hard to get a link from YouTube. And it contains relevant anchor text on an indexable page, one that Google can actually browse and see, that is going to provide the maximum link benefit. So a href="https://yoursite.com" great tool for audience intelligence, that would be the ideal link for my new startup, for example, which is SparkToro, because we do audience intelligence and someone saying we're a tool is perfect. This is a link that Google can read, and it provides this information about what we do. It says great tool for audience intelligence. Awesome. That is powerful anchor text that will help us rank for those words and phrases. There are loads more. There are things like which pages linked to and which pages linked from. There are spam characteristics and trustworthiness of the sources. Alt attributes, when they're used in image tags, serve as the anchor text for the link, if the image is a link. There's the relationship, the topical relationship of the linking page and linking site. There's text surrounding the link, which I think some tools out there offer you information about. There's location on the page. 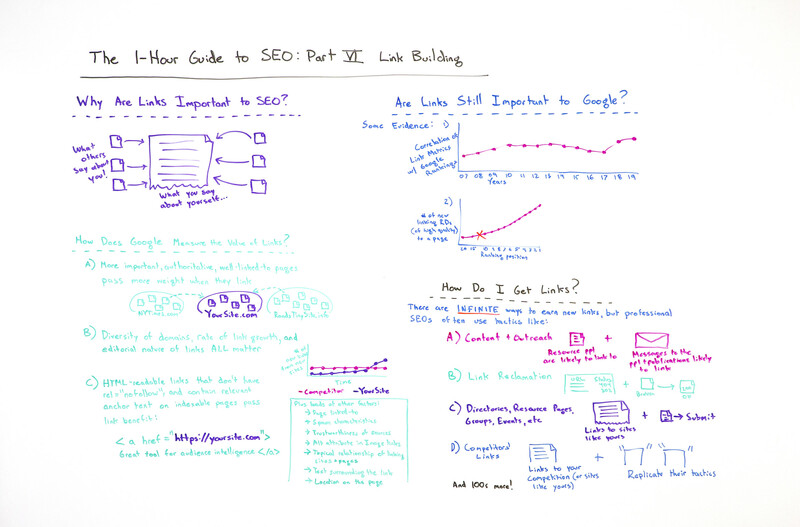 All of this stuff is used by Google and hundreds more factors to weight links. The important part for us, when we think about links, is generally speaking if you cover your bases here, it's indexable, carries good anchor text, it's from diverse domains, it's at a good pace, it is editorially given in nature, and it's from important, authoritative, and well linked to sites, you're going to be golden 99% of the time. Many folks I think ask wisely, "Are links still that important to Google? It seems like the search engine has grown in its understanding of the web and its capacities." Well, there is some pretty solid evidence that links are still very powerful. I think the two most compelling to me are, one, the correlation of link metrics over time. So like Google, Moz itself produces an index of the web. It is billions and billions of pages. I think it's actually trillions of pages, trillions of links across hundreds of billions of pages. Moz produces metrics like number of linking root domains to any given domain on the web or any given page on the web. Moz has a metric called Domain Authority or DA, which sort of tries to best replicate or best correlate to Google's own rankings. So metrics like these, over time, have been shockingly stable. 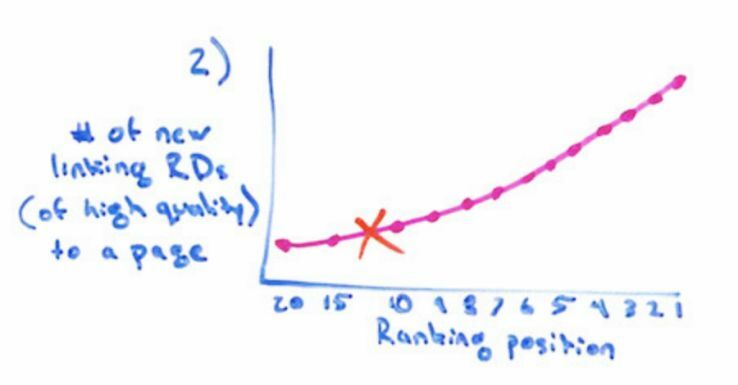 If it were the case someday that Google demoted the value of links in their ranking systems, basically said links are not worth that much, you would expect to see a rapid drop. But from 2007 to 2019, we've never really seen that. It's fluctuated. Mostly it fluctuates based on the size of the link index. So for many years Ahrefs and Majestic were bigger link indices than Moz. They had better link data, and their metrics were better correlated. When you see a correlation of 0.25 or 0.3 with one number, linking root domains or page authority or something like that, that's pretty surprising. The second one is that many SEOs will observe this, and I think this is why so many SEO firms and companies pitch their clients this way, which is the number of new, high quality, editorially given linking root domains, linking domains, so The New York Times linked to me, and now The Washington Post linked to me and now wired.com linked to me, these high-quality, different domains, that correlates very nicely with ranking positions. Obviously, this is not alone, but very common. So I think the next reasonable question to ask is, "Okay, Rand, you've convinced me. Links are important. How do I get some?" Glad you asked. There are an infinite number of ways to earn new links, and I will not be able to represent them here. But professional SEOs and professional web marketers often use tactics that fall under a few buckets, and this is certainly not an exhaustive list, but can give you some starting points. Second is link reclamation. So this is essentially the process of saying, "Gosh, there are websites out there that used to link to me, that stopped linking." The link broke. The link points to a 404, a page that no longer loads on my website. The link was supposed to be a link, but they didn't include the link. They said SparkToro, but they forgot to actually point to the SparkToro website. I should drop them a line. Maybe I'll tweet at them, at the reporter who wrote about it and be like, "Hey, you forgot the link." Those types of link reclamation processes can be very effective as well. They're often some of the easiest, lowest hanging fruit in the link building world. I don't think we actually did this, but we could easily go, "Hey, you should include Moz as a woman-owned business.We should be part of your directory here in Seattle." Great, that's a group we could absolutely join and get links from. The simple, free way to do it is to say, "I have competitor 1 brand name and competitor 2 brand name.I'm going to search for the combination of those two in Google, and I'm going to look for places that have written about and linked to both of them and see if I can also replicate the tactics that got them coverage." The slightly more sophisticated way is to go use a tool. Moz's Link Explorer does this. So do tools from people like Majestic and Ahrefs. I'm not sure if SEMrush does. But basically you can plug in, "Here's me. Here's my competitors. Tell me who links to them and does not link to me." Moz's tool calls this the Link Intersect function. But you don't even need the link intersect function. You just plug in a competitor's domain and look at here are all the links that point to them, and then you start to replicate their tactics. There are hundreds more and many, many resources on Moz's website and other great websites about SEO out there that talk about many of these tactics, and you can certainly invest in those. Or you could conceivably hire someone who knows what they're doing to go do this for you. Links are still powerful. Okay. Thank you so much. I want to say a huge amount of appreciation to Moz and to Tyler, who's behind the camera — he's waving right now, you can't see it, but he looks adorable waving — and to everyone who has helped make this possible, including Cyrus Shepard and Britney Muller and many others. Hopefully, this one-hour segment on SEO can help you upgrade your skills dramatically. Hopefully, you'll send it to some other folks who might need to upgrade their understanding and their skills around the practice. And I'll see you again next week for another edition of Whiteboard Friday. Take care. The post Here’s how digital word of mouth and search have converged appeared first on Search Engine Land. The post AMP WordPress plugin now supports Stories appeared first on Search Engine Land.